Goldfinger owned it. Daniel Craig was shot on its steps. And now, the golf clubhouse at Stoke Park Country Club, Spa & Hotel, in Buckinghamshire, has been named the fifth most iconic clubhouse in world golf. Ladies and gents, the moment you’ve all been waiting for… well, probably not so much, I have to admit. But I don’t care and started creating these short films anyway! With this post I’d like to show you my first little clip, playing a round in Stoke Park, just outside of London with a fellow German golf blogger (www.golfnerd.de). Just for this purpose I bought one of these new brilliant tiny action cameras, the Hero2 from GoPro and a little tripod, the Cullmann Magnesit Copter, which is also very useful as a camera grip. All in all, a perfect match-up and real fun to play around. And while many people will say: “What? Golf… filmed? How boring!” I will respond: “No, it’s not, at least for me!” But everyone has a right to his own opinion. Tell me what you think! Highly appreciate your honest comments! Stay tuned for more extensive videos to come over the next months. I’m still thinking about contents but focus will be on courses and the beauty of the sport itself… not me, telling you guys something about swing rhythm and the new Callaway drivers. I keep you posted. A couple of weeks ago I took my bag and made my way to Stoke Park, a bit outside of west London. I met with a fellow golf blogger and we had a lovely day at this famous golf & country club that hosted various major films and was set for one of the most important golf scenes in modern film; the round of golf of James Bond 007 playing Auric Goldfinger in a matchplay. 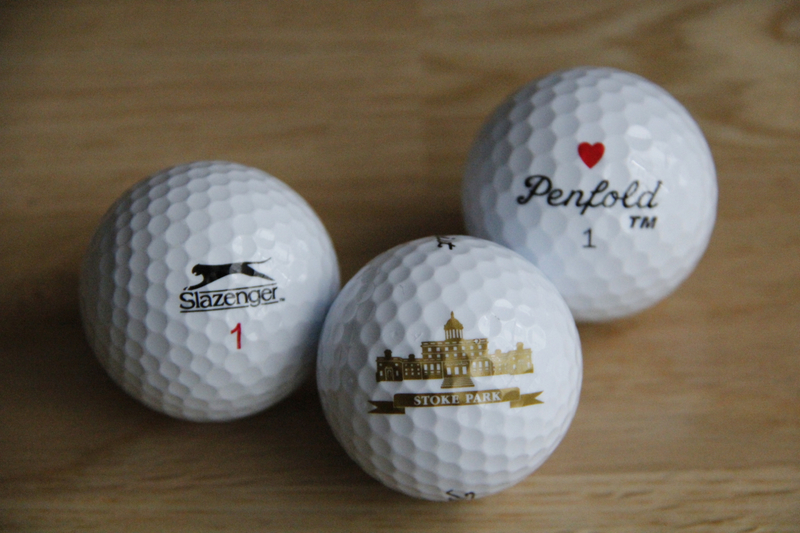 I organised a dozen of Penfold Heart balls and my mate was playing with Slazengers – just like Bond and Goldfinger. Stoke Park owns an impressive 27-hole course and the day was (except some rain during the round) a very enjoyable experience. I wonder why they don’t sell the Bond-Experience in some way: organising the balls, maybe a caddie looking like Auric’s butler Oddjob, some wodka martinis in the bar afterwards… they could really make a fortune I guess, people from all over the world would love it. There are some golf courses in the world that really attract me and which I want to play rather sooner than later. Wentworth in south-west London is one of that category but as well others on the British Isles, like The Belfry, Gleneagles, Celtic Manor, St. George’s Hill or some others world wide in Spain, California, Florida or elsewhere (for some reason I don’t fancy playing St. Andrews at all). Mostly they made it onto my list because these courses are supposed to be outstanding beauties among all golf courses or they hosted some major golf tournaments, just like Gleneagles which will be the next Ryder Cup venue. 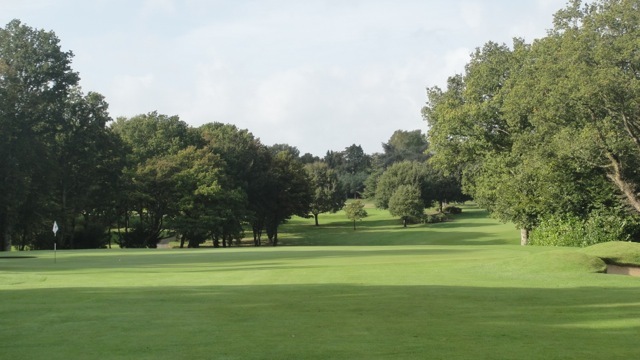 In general I think it’s a very attractive thing to do, playing golf where golf legends made their way up and down the fairways and greens that became famous just for that; hosting tournaments and offering the most pleasant course imaginable to the living golfing heroes. And there are these other courses that made it onto my list because of other celebrities that used to play there. Stoke Park, a stone-throw from central London is one of these facilities. Stoke Park was venue for one of the most famous golfing scenes in films ever produced: Auric Goldfinger playing James Bond in a matchplay over 18 holes at this 27-hole venue, cheating on 007 with the help of his caddie Oddjob and in the end to lose the game against the British MI6 agent. The course plays a major role in this not-so-short scene and is one of these wanna-play-in-my-lifetime courses for many golf (and Bond) maniacs this then. Arriving at Stoke Park is like arriving in a different time or taking part in the particular film, a very strange feeling because you really recognise the venue, the famous club house at least. The weather was bad the days before, as always in mid-October. It was pouring down just the evening before, so I made sure I had my rain gear with me. I needed it and my thermo underwear as well, so not really the best circumstances to play a round that should be remembered forever but still worth the effort making all the way and having the day off on a Wednesday… btw a day on a golf course beats a day in the office big time, I can tell you (but you probably know already). As a consequence the course was really wet and with ‘wet’ I mean it looked a bit like the north-England Lake District. Even the greens were muddy and some were covered with water for the most part. Not the best condition to play the round of your life but still not as bad as thinking about cancelling all that! 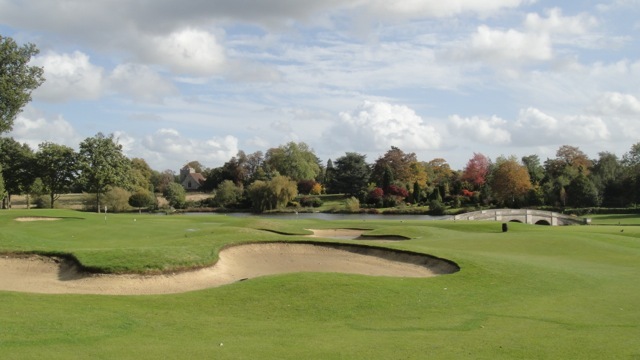 The course design by Harry Colt is a parkland style for at least the first 18 holes. There are lots of bunkers but more in this old-fashioned way, and I were lucky enough to stand in most of them (hope you reckognise the irony I put into this sentence, looking at my overall score). The hole no 7 is an interesting par-3 that stood template for the 12th at Augusta National, probably one of THE most famous holes in the world (next to the 7 at Pebble Beach or the 17 at TPC Sawgrass). That was just the moment when the rain arrived again and we had to jump into our rain dresses. Just on-time for one of the toughest greens to putt at the 8th and the green with the most water on it at the 9th where basically 75% was covered with water… interesting putt I can tell you. Approach pitches didn’t roll anywhere and were buried in their own mark on most holes. But I don’t want to complain, we had lots of fun and were just a bit unfortunate with the weather and course conditions. 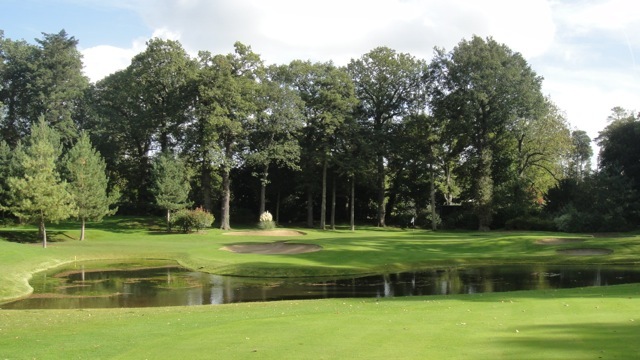 I bet during summertime (in England… see, irony again) the course is in much better shape and a real treat with course design, flora and service in the attached hotel complex. Holes 15 to 17 and some of the last 9 of the 27 holes have even more water to offer, however on purpose this time as they open up to some tough lakes and several water hazards to cope with. I will never forget Stoke Park’s 18th, not only because of the Bond/Goldfinger showdown but as well because of the 4-putt I had here. In the end, and I’m man enough to admit, I scored a flat 100 with 2 double-par 8s… shame on me – and all that with the ’break 80’ goal in mind. One could argue I couldn’t find my game on that particular day, which is completely correct, but I had fun anyway. On the one hand because of the famous course we were playing and on the other hand because it was fun to walk 18 holes with my fellow golf blogger. We enjoyed ourselves, had many things to discuss both on and off the course and we will probably meet again for another interesting round somewhere else.